The first stars in the Universed formed from a primordial gas, consisting of about 76% hydrogen and 24% helium, about 100 - 300 million years after the Big Bang. The typical formation sites of the first stars are considered to be minihaloes of dark matter with about 100.000 solar masses, forming at cosmological redshifts between 15 and 25. Star formation at all redshifts requires an efficient cooling mechanism, so that the gas can radiate away part of its energy and go through gravitational collapse. In the absence of such a cooling mechanism, the thermal evolution of the gas would be adiabatic, implying a strong increase of the gas pressure with density, which would prevent further collapse. In the primordial Universe, and in the small halos considered here, the only efficient cooling mechanism is line cooling by molecular hydrogen. 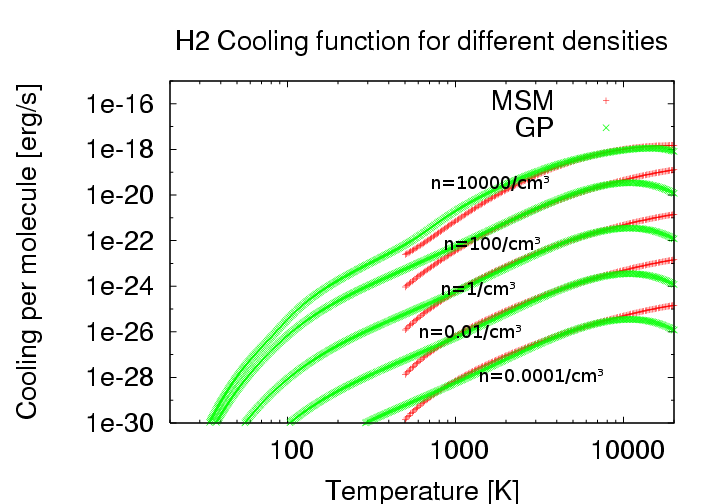 As one can see in the following figure, molecular hydrogen cooling can be efficient down to temperatures of about 300 K.
Fig. 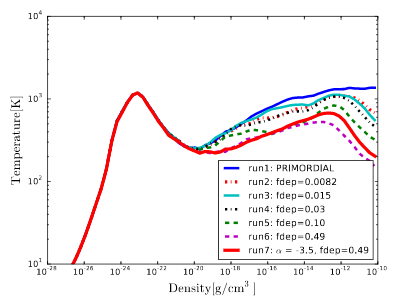 1: The H2 cooling function as a function of gas temperature for different number densities. The temperatures are thus considerably enhanced compared to the temperature in Milky Way molecular clouds, where efficient cooling is possible via dust grains, and the temperature is about 10 K. (It is not the molecular hydrogen in the clouds that is driving the cooling.) The large difference in the temperature leads to a considerable difference in the thermal pressure. The formation of self-gravitating clumps, which subsequently contract to form stars, is sensitively regulated by the equilibrium between gravitational and pressure forces, and in case of a higher pressure, the mass of the clumps needs to be considerably enhanced to compensate for the higher pressure. In the early Universe, we therefore expect that the first stars have been about one hundred times more massive than the mass of our Sun. This has strong implications, as such massive stars have short lifetimes of only a few million years, and will subsequently explode as a supernova, enriching the abient medium with heavy elements. How many clumps will form in the disk, and what is their mass distribution? Will each clump form an individual, single star, or can clumps eventually merge? What is the merger rate, and does it contribute to the formation of very massive stars? Can ejections of low-mass stars occur, leading to the formation of low-mass primordial stars? Such stars would have much longer lifetimes, and could still be found in the Milky Way galaxy today. 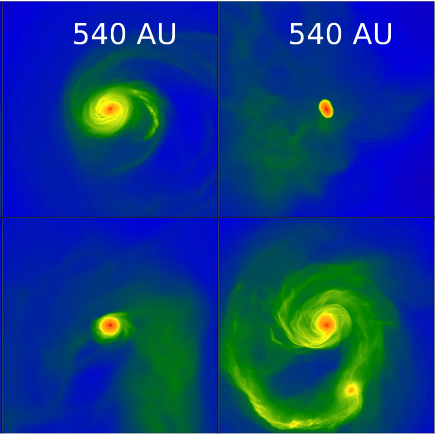 Our group is addressing these questions using a combination of hydrodynamics-codes (particularly GRADSPH coupled with the astrochemistry package KROME as well as N-body codes like the AMUSE package or the Nbody6-code to address these questions both in the gas-dominated and the protostar-dominated regime. The thermal evolution may substantially change in the presence of metals and dust grains injected by the first supernova explosions. Metals in the gas phase may enhance the cooling at intermediate densities between 100 - 100.000 atoms per cubic centimeter via contributions for carbon and oxygen lines, dust cooling becomes particularly efficient at high densities, leading to a second dip in the temperature evolution. Even for metallicities well below 0.01% of the solar metallicity, where metal line cooling is completely inefficient, dust cooling can still contribute at densities of one 1.000.000.000.000 molecules per cubic centimeter or higher. The presence of dust grains may dust substantially contribute to the cooling and enhance fragmentation already at early times. Due to strong efforts in the field of stellar archeology, a number of extremely metal poor stars is currently known. This includes in particular the class of the carbon-enhanced metal poor stars, where the carbon and oxygen abundance is enhanced compared to iron, potentially hinting to metal enrichment via type II supernovae. A prominent example is SMSS J031300.36-670839.3, whose abundance patterns are consistent with one single preceding supernova explosion. 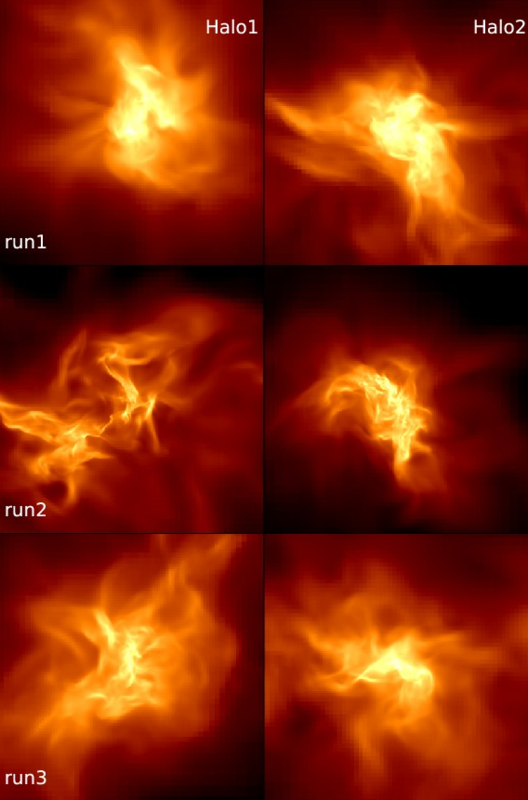 We have modeled its potential formation history in 3D simulations (Bovino et al. 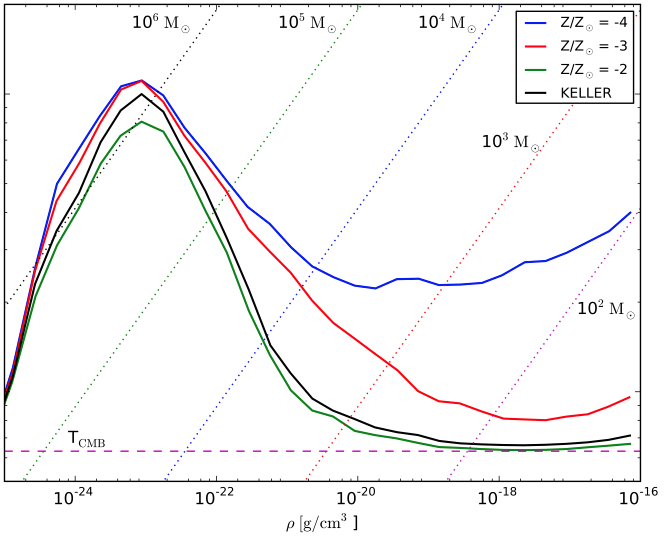 2014), showing that its carbon abundance is already so high that the gas cools down to the temperature of the Cosmic Microwave Background (CMB), thus implying a strong transition in the stellar masses and the stellar population. Fig. 5: Temperature evolution for different metallicities, as well as the abundances of SMSS J031300.36-670839.3 observed by Keller et al. (2014). The gas rapidly cools to the temperature of the CMB when adopting the observed abundances. Another very prominent example is the close-to-primordial star SDSS J102915+172927. The metal abundances in this star are so low that metal line cooling is no longer possible, leaving dust cooling as the only possibility to provide an efficient mechanism for strong fragmentation. Using 3D simulations (Bovino et al. 2016), our group has shown that dust cooling can create a temperature dip at high densities, providing a mechanism to enhance fragmentation. 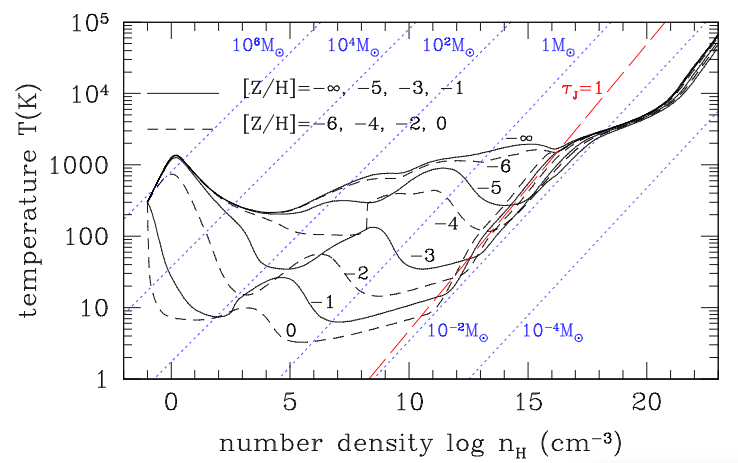 We however also found that the required dust mass needs to be an order of magnitude larger than considered by previous estimates. Fig. 6: Temperature evolution under different assumptions for the dust mass and distribution (Bovino et al. 2016).